Arelia (Werner) Schoeneberg is a hydrologist at the Pacific Climate Impacts Consortium, where she is investigating the influence of climate change on streamflow for several major watersheds in BC. 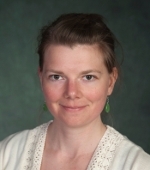 Her areas of expertise include hydrologic modelling, selecting global climate models, evaluating future projections and statistical downscaling. Arelia started at PCIC in 2006, holds a BSc in Environmental Science from UBC and a MSc in Geography from the Water and Climate Impact Research Centre at UVIC. Kumar, S., F. Zwiers, P.A. Dirmeyer, D.M. Lawrence, R. Shrestha, and A.T. Werner, 2016. Terrestrial Contribution to the Heterogeneity in Hydrological Changes under Global Warming. Water Resour. Res., 52, 3127–3142, doi:10.1002/2016WR018607. Werner, A.T. and A.J. Cannon, 2016. Hydrologic extremes – an intercomparison of multiple gridded statistical downscaling methods, Hydrol. Earth Syst. Sci., 20, 1483-1508, doi:10.5194/hess-20-1483-2016, 2016. Arora, V.K., Y. Peng, W.A. Kurz, J.C. Fyfe, B. Hawkins, and A.T. Werner, 2016. Potential near-future carbon uptake overcomes losses from a large insect outbreak in British Columbia, Canada. Geophys. Res. Lett., 43, 2590-2598, doi:10.1002/2015GL067532. Werner, A.T. and Cannon, A.J., 2015. Hydrologic extremes – an intercomparison of multiple gridded statistical downscaling methods, Hydrol. Earth Syst. Sci. Discuss., 12, 6179-6239, doi:10.5194/hessd-12-6179-2015. Werner, A.T., Prowse, T.D., Bonsal, B.R. Characterizing the Water Balance of the Sooke Reservoir, British Columbia over the Last Century. Climate 2015, 3, 241-263. Shrestha, R.R., M.A. Schnorbus, A.T. Werner and F.W. Zwiers, 2014. Evaluating hydro-climatic change signals from statistically and dynamically downscaled GCMs and hydrologic models. Journal of Hydrometeorology, 15, 844-860. doi: http://dx.doi.org/10.1175/JHM-D-13-030.1. Peng, Y., Arora, V. K., Kurz, W. A., Hember, R. A., Hawkins, B. J., Fyfe, J. C., and Werner, A. T., 2014. Climate and atmospheric drivers of historical terrestrial carbon uptake in the province of British Columbia, Canada. Biogeosciences, 11, 635-649, doi:10.5194/bg-11-635-2014. Schnorbus, M., A. Werner, and K. Bennett, 2014. Impacts of climate change in three hydrologic regimes in British Columbia, Canada. Hydrological Processes, 28(3): 1170-1189, DOI: 10.1002/hyp.9661. Werner, A.T., M.A. Schnorbus, R.R. Shrestha and H.D. Eckstrand, 2013. Spatial and temporal change in the hydro-climatology of the Canadian portion of the Columbia River Basin under multiple emissions scenarios. Atmosphere-Ocean, 51(4): 357-379. Bürger, G., S. Sobie, A. Cannon, A. Werner, and T. Murdock, 2012. Downscaling extremes - an intercomparison of multiple methods for future climate. Journal of Climate, 25(12): 4366-4388. Shrestha, R.R., M.A. Schnorbus, A.T. Werner, and A.J. Berland, 2012. Modelling spatial and temporal variability of hydrologic impacts of climate change in the Fraser River basin, British Columbia, Canada. Hydrological Processes, 26(12): 1840-1860. Bennett, K.E., A.T. Werner and M.A. Schnorbus, 2012. Uncertainties in hydrologic and climate change analyses in headwater basins of British Columbia, Journal of Climate, 25(17): 5711-5730. Bürger, G., T.Q. Murdock, A.T. Werner, S.R. Sobie, and A.J. Cannon. 2012. Downscaling extremes - an inter-comparison of multiple statistical methods for present climate. Journal of Climate, 25(12): 4366-4388. Picketts, I.M., A.T. Werner, T.Q. Murdock, J. Curry, S.J. Dery and D. Dyer, 2012. Planning for climate change adaptation: lessons learned from a community-based workshop. Environmental Science & Policy, 17: 82-93. Bürger, G., J. Schulla and A.T. Werner, 2011. Estimates of future flow, including extremes, of the Columbia River headwaters. Water Resources Research, 47(W10520): 1-18. Allen, D., P.H. Whitfield and A. Werner, 2010. Groundwater Level Responses in Temperate Mountainous Terrain: Regime Classification, and Linkages to Climate and Streamflow. Hydrologic Processes, 24(23): 3392-3412. Beckers, J., B. Smerdon, T. Redding, A. Anderson, R. Pike and A.T. Werner, 2009. Hydrologic Models for Forest Management Applications: Part 1: Model Selection. Streamline, 13(1): 35-44. Beckers, J., R. Pike, A.T. Werner, T. Redding, B. Smerdon, and A. Anderson, 2009. Hydrologic Models for Forest Management Applications: Part 2: Incorporating the Effects of Climate Change. Streamline, 13(1): 45-54. Dawson, R., A.T. Werner, and T.Q. Murdock, 2008, Cariboo-Chilcotin: Climate Change Analysis, LINK - FORREX Forum for Research and Extension in Natural Resources, Volume 10 – Issue 3, Fall 2008. White, T., J. Wolf, F. Anslow, A. Werner, Indicators of Climate Change for British Columbia 2016 Update, Indicators: Timing and Volume of River Flow. British Columbia. Ministry of Water, Land and Air Protection, 57 pgs. PCIC, 2014: Testing the Monthly drought code as a Metric for Fire Weather in Southeast BC, Summary Report. Shumlich, M. (ed). D. W. van der Kamp, G. Bürger and A. T. Werner, 2013: Evaluation of the monthly drought code as a metric for fire weather in a region of complex terrain, and uncertainties in future projections. The Pacific Climate Impacts Consortium, Victoria, British Columbia, Canada, 16 pp. Hamlet, A.F., M. Schnorbus, A. Werner, M. Stumbaugh and I. Tohver, 2013. A Climate Change Scenario Inter-comparison Study for the Canadian Columbia River Basin: Summary Overview, 13 pp. Hamlet, A.F., M. Schnorbus, A. Werner, M. Stumbaugh and I. Tohver, 2013. A Climate Change Scenario Inter-comparison Study for the Canadian Columbia River Basin: Technical Report, 66 pp. Werner, A.T., 2011. BCSD Downscaled Transient Climate Projections for Eight Select GCMs over British Columbia, Canada. Pacific Climate Impacts Consortium, University of Victoria, Victoria, BC, 63 pp. Schnorbus, M.A., K.E. Bennett, A.T. Werner and A.J. Berland, 2011. Hydrologic Impacts of Climate Change in the Peace, Campbell and Columbia Watersheds, British Columbia, Canada. Pacific Climate Impacts Consortium, University of Victoria, Victoria, BC, 157 pp. Murdock, T.Q. and A.T. Werner, 2011. Canadian Columbia Basin Climate Trends and Projections: 2007-2010 Update. Pacific Climate Impacts Consortium, University of Victoria, Victoria, BC, 43 pp. Schnorbus, M., K. Bennett and A.T. Werner, 2010. Quantifying the water resource impacts of mountain pine beetle and associated salvage harvest operations across a range of watershed scales: Hydrologic modelling of the Fraser River basin. Information Report: BC-X-423, Natural Resources Canada, Canadian Forestry Service, Pacific Forestry Centre, Victoria, BC, 64 pp. Werner, A.T., H.K. Jaswal and T.Q. Murdock, 2009. Climate Change in Dawson City, YT: Summary of Past Trends and Future Projections. Pacific Climate Impacts Consortium, University of Victoria, Victoria BC, 40 pp. Picketts, I.M., A.T. Werner and T.Q. Murdock, 2009. Climate change in Prince George: summary of past trends and future projections. Pacific Climate Impacts Consortium, University of Victoria, Victoria BC, 48 pp. Rodenhuis, D.R., K.E. Bennett, A.T. Werner, D. Bronaugh and T.Q. Murdock, 2009. Climate Overview 2007: Hydro-Climatology and Future Climate Impacts in British Columbia, July 2009. Bennett, K.E., Werner, A.T. and M. Schnorbus, 2009, Uncertainties in Hydrologic and Climate Change Impact Analyses in a Headwater Basin of the Peace River Watershed, Hydrology Research, Special Issue from the 17th NRB Conference, 15 pp. Dawson, R., A.T. Werner, and T.Q. Murdock, 2008, Preliminary Analysis of Climate Change in the Cariboo-Chilcotin Area of BC, Integrated Land Management Bureau, Pacific Climate Impacts Consortium, University of Victoria, Victoria, BC. Werner, A.T., 2007. Seasonality of the Water Balance of the Sooke Reservoir, BC, Canada. Masters of Science Thesis, Water and Climate Impacts Research Centre, Department of Geography, University of Victoria, Victoria, BC, Canada. Werner, A.T. and T.Q. Murdock, 2007. Summary Report: Changes in Past Hydro-climatology and Projected Future Changes – For the City of Whitehorse, Pacific Climate Impacts Consortium, University of Victoria, Victoria, BC. Murdock, T.Q., D. Bronaugh and A.T. Werner, 2007. Preliminary Analysis of BC Climate Trends for Biodiversity, Pacific Climate Impacts Consortium, University of Victoria, Victoria, BC. Bennett, K.E., T.Q. Murdock and A.T. Werner, 2007. Greater Vancouver Regional District Historical and Future Rainfall Analysis Update, Pacific Climate Impacts Consortium, University of Victoria, Victoria, BC. Murdock, T., J. Fraser, and C. Pearce (Editors), 2007. Preliminary Analysis of Climate Variability and Change in the Canadian Columbia River Basin: Focus on Water Resources. Contributing authors: Werner, A., K. Bennett, J. Runnells, R. Lee, D, Rodenhuis, and B. Menounos. Pike, R.G, K.E. Bennett, T. Redding, A.T. Werner, D. Spittlehouse, R.D. Moore, T.Q. Murdock, J. Beckers, B. Smerdon, K. Bladon, V. Foord, D. Campbell, and P. Tschaplinski. 2010. Chapter 19: Climate Change Effects on Watershed Processes in BC. In Compendium of Forest Hydrology and Geomorphology in British Columbia. R.G. Pike et al. (editors). B.C. Ministry of Forests and Range, Research Branch, Victoria, B.C. and FORREX Forum for Research and Extension in Natural Resources, Kamloops, B.C. Land Management Handbook 66, pgs 699-747. Beckers, J., B. Smerdon, and M. Wilson. (A.T. Werner Reviewer) 2009. Review of hydrologic models for forest management and climate change applications in British Columbia and Alberta. FORREX Forum for Research and Extension in Natural Resources, Kamloops, BC FORREX Series 25. Werner, A.T. contributing author in: Walker, I.J. and Sydneysmith, R. (2008): British Columbia; in From Impacts to Adaptation: Canada in a Changing Climate 2007, edited by D.S. Lemmen, F.J.Warren, J. Lacroix and E. Bush; Government of Canada, Ottawa, ON, p. 329-386. Werner, A.T., J.J. Gibson, D. Hutchinson, M.L. Lacroix, D.L. Peters, and T.D. Prowse. 2006. Estimating Inflows to the Sooke Reservoir, Victoria, BC. Canadian Water Resources Association 2006 BC Branch Conference “Water Under Pressure: Balancing Values, Demands and Extremes”, presented October, 25-27, Vancouver, BC, CA.